Longing for the taste of a summer tomato? This is the next best thing. The slow roasting process yields a flavour-packed punch to the taste buds. Sounds tedious, but trust me, it’s just delightful. 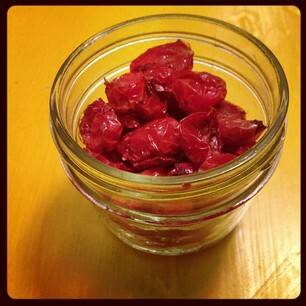 And so much better than the sun-dried tomatoes you buy in a jar! Well worth the long roasting time. I threw them on top of a rice and lentil dish as a garnish, but they could also be used to top some ricotta on crusty bread, maybe with a little balsamic reduction. Or on top of pasta with some Parmesan and basil. Whatever you don’t use right away (or eat off the pan like I did) can be put in a jar, topped up with olive oil, and refrigerated for use later. Imagine the possibilities! 1. Preheat the oven to 225F. 2. Slice the tomatoes in half and put them on a baking sheet. 3. Drizzle the tomatoes with olive oil, then salt and pepper them. 4. Roast them for 2 – 2.5 hours, until they have lost most of their moisture but are not crispy. You will need to watch them for the last half hour or so if the process so you don’t overdo them. 5. Let the tomatoes cool and then place them in a jar. Add olive oil to cover the tomatoes, and store the far in the fridge. The olive oil can be used for cooking foods like tomato sauces, and making salad dressing.